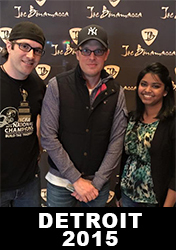 Joe Bonamassa Forum → Joe's Guitars, Amps and Gear → Joe's Big Reverbicated/delayed tone. Topic: Joe's Big Reverbicated/delayed tone. The very first thing i noticed about Joe B's tone when i first heard him was that he had a really nice subtle delay that really cleans up his gain and gives humongeous depth to his tone. this sound is mostly from the New Day Yesterday Live CD and blues deluxe era. Joe says he uses a Boss DD-3, i bought one and fooled with it, and i just cant get it to sound right, its too in the way and digital sounding, so i returned it and got an Ibanez AD-6 Analog Delay pedal, its better, but still way too in your face with a high gain setting. Im not looking to get Joe Bonamassa's tone, i just want to know how he works his delay, does anyone have any suggestions? again, im not looking for "Run Like Hell" really prominent delay, its almost used as a reverb, i just cant seem to find a pedal that works. heres the funny thing. I can achieve this tone on my practice amp its a Marshall MG30, the delay that comes with that amp is Phenomenal!! the amp is just too small. I need a good delay for my Jcm900 cuz it doesnt come with any effects. all comments welcome! Re: Joe's Big Reverbicated/delayed tone. I remember Joe saying that he uses the DD-3 with all the knobs on 12 o'clock. I don't know if he uses an older or newer DD3 though. Running in stereo is a big part of his sound one side dry one side wet. If your Marshall is a stereo cab all you need is to buy another amp. Hey Jim, I like that little smiley face you put after "all you need to do is buy another amp"
LOL. That usually makes me smile when I think of buying a new amp or guitar!! All my tears they fell like rain, cant you hear them falling? Yeah, a second amp really sounds good. I don't gig with this set up, but I find that the stereo out on my Maxon AD999 works real well to spread out the delay. My two amps are set about 8' apart (THD Univalve and Fender Champ). Joe of course doesn't spread his amps out. They are behind the plexi shield. they are mic'd and panned hard left and right in the FOH. The plexi shields are the best thing to happen for controling stage volume. The club I book for in OKC has them available and require their use for all local bands. With some convincing even the national acts will give them a try. Mato was here in early December and used one. He wanted to buy it and take it with him. Clear Sonic recently started making a 3 foot tall by 4 foot wide panel that will cover a Marshall cabinet. Joe uses a custom made 34" by 6' that covers his side by side Marshall style cabinets. They have a 2' by 4' standard size that will cover any Fender. We had a Tool type act in last week and they couldn't believe how much it helped their stage volume problems and being able to hear the monitors. I read an article where Warren Haynes uses a piece of plywood in front of his amp wich also had a mic on it. He called it plywood slapback. He says this technique yields a stereo image with more balls and immediacy than youd get from a typical stereo reverb or effects processor. Thanks for the feedback! its funny that you mention it, his "A New Day Yesterday Live" Cd is mixed in that stereo you guys were talkin about. the left side is really reverbicated with some delay on it, and the right track has a completely dry guitar track, the reverb/delay track on the left is a bit quieter to creat the far away echoing sound. this tone is exactly what im talkin about! thanks guys......oh **##....now i need to buy another amp! lol. PS. OO i just thought of something...do you think the same thing would happen if you ran the signal through the PA at the venue and double miked the amp, and panned one hard right and one hard left and added the effects in through the pa? i guess you wouldnt get the same feeling while playing, a completely dry guitar track is a little harder to play with, or maybe hearing it through the monitor would help? oh well. thanks anyways guys! Thanks for the good question and Joe for the explanation. Although you lost me at the FX loop part. I guess that means the delay is between the pre and power amp instead of in front of. I'm going to stick this topic since a lot of people wonder how Joe gets that fat sound. The first time I saw Joe Eric Johnson is who he reminded me of and I could hear the influence EJ had on Joe. Hey Joe- When you use the Two Rock (Which, for those of you who don't know, is one of the better Dumbleish amps on the market) do you run it fairly clean or do you push the tubes with some gain? Joe...Thanks so much! I'd just like to add that you've given me a new boost of motivation on the axe man, im hoping to get down to New Haven in Febuary to see your show, if i run into you ill say hi! anyway this goes out to anyone that can answer me, i know it sounds dumb...I dont know too much about gear i kinda play and worry about my tone, but i dont know **## about gear, lol. anyway here it goes. How do i run two amps simutaneously? theres gotta be some signal splitter...but how do i do that without losing tone and volume and stuff? ps. joe, I go to Berklee in boston and im sure Berklee would be more than happy to have you for a clinic at the performance center! see if you can swing that next time your in boston cuz most berklee guitarists havent heard of you, i try and preach your music as much as possible, but a clinic would get you some exposure. take care. Did you use the dd-3 in your Budda loop as well? Joe, did I see a Fulltone Tube Echo next to your amps Saturday night? I noticed the echo intensity and repeats did not change during the show. Sacrificing flexibility for tone, possibly? 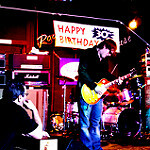 Craig's Guitar Tech Resource - free information online. Guitar Repair and Customization in Northeast Ohio since 1979. "1st ( Jim your right) you need a wet and a delay amp.. Preferably two different kinds of overdrive. ex.Marshall/lFender or Marshall / Dumble.. Those are the two I use.."
By the way, I use a Marshall DSL100 Channel B along with an old Hiwatt for overdriven stuff, and the Marshall channel A along with a Fender for cleaner things. Similar to Joe's setup, just different. My DDL runs in the effects loop of the Marshall. Very big sound and very versatile.